In this video, I share with you my Sales Funnel Template that will help you to attract your potential customers and turn your leads into sales. I’ll show you how it all works, literally from the inside so join me on this voyage to the bottom of a sales funnel. A sales funnel is simply a process that you take your customers through to buy your products or services. At the end of this video, you will be able to download free cheat sheet, featuring this sales funnel template I call, the ABCD Strategy. We use video for each of the four stages. At the top of the funnel, our objective is to Attract our target audience by using videos focusing on the keywords that your audience is using for search results. Your “A” videos need provide solutions to your audience’s problems. These videos are typically short – up to around 3 minutes. Think of it as the start of a relationship. It’s your first date, you want to keep it short and sweet. It’s not the time for any deep sales message. These videos should be hosted on YouTube so it will be found in search results as well as other social media platforms that your target audience users. The important thing about your A videos is that they should have a strong Call to Action. This may be a visit to your website or to capture their email details by having them opt-in for a free gift. Once your audience has discovered you, they will want to get to know your better. And this is where your “B” videos or Brand videos come into play. These are longer videos that share your brand story, your beliefs and values, and the why you do what you do. This helps to develop a stronger relationship and creates a community where you are the leader. 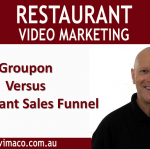 Your “C” or Convert videos nurture your leads until they are ready to buy from you. During this stage you use email with links to your videos that provide details about your products or services. These videos focus on the benefits of your offers and provide solutions to their problems. Use testimonial videos or case studies to create social proof. By tracking the responses of your emails, you will know which of your leads are clicking the links to watch your product videos and how long did they watch your videos for. This information allows you to know when your leads are ready to buy. Again use video to give your hot leads a special offer such as a bonus package or a discount and add scarcity such a limited time on the offer. Live webinars with your leads are highly effective as they allow you to answer any questions or objections they may have about for offer and lead them to the sale. But the sale is not the end of the process. It’s now time to unroll the “D” videos and delight your customers. Use videos for questions about trouble-shooting issues, and to reduce post purchase dissonance. Finally encourage user – generate videos of your customers using your products and feature them on your Youtube channel or website.